Republican presidential candidate Carly Fiorina takes part in the presidential debates at the Reagan Library on Sept. 16, 2015 in Simi Valley, California. 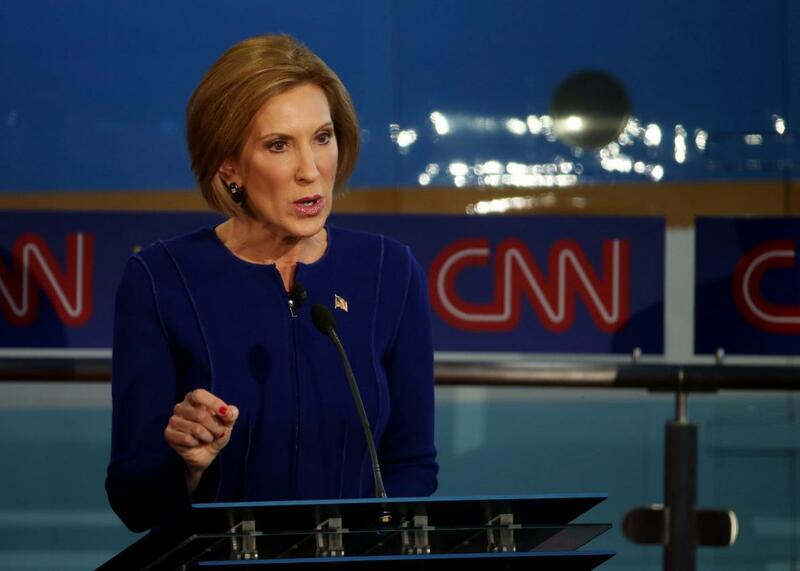 Carly Fiorina did the most to help her campaign in the three-hour CNN Iron Man debate. She did two things that the men who were once front-runners have had a hard time doing: She bested Donald Trump in a tussle and she used her answers to set herself apart from the pack. The second GOP debate touched on issues from pot legalization to gun rights to how to defeat ISIS. And there were plenty of side moments. Jeb Bush and Trump debated whether the real estate magnate had tried to open a casino in Florida; Bush defended his wife; Ben Carson and Trump exchanged views on vaccinations; Fiorina spoke of burying a child who had died of drug addiction. For Republican voters the 11 candidate lineup represented the challenge of this campaign: so much to choose from, and little help winnowing the field. If anything, the choice is now harder. Every candidate had a moment they can promote, though some—like Fiorina, Sen. Marco Rubio, and Gov. Chris Christie—did better than others. Fiorina’s first success came when she gave an answer that combined the issues of Planned Parenthood and the recent nuclear deal with Iran. “One has something to do with the defense of the security of this nation,” she said. “The other has something to do with the defense of the character of this nation.” (Though her story about Planned Parenthood was misleading). Bush and Gov. Scott Walker, by contrast, never conveyed the same sense of ownership. That was not the only moment that Trump was on his heels. At the start of the debate everyone ganged up on the Donald. What may have hurt him the most wasn’t when he was in the thick of the fight, but when he was silent. For a long stretch, when the candidates engaged in a somewhat specific discussion of the issues, he disappeared. Trump’s answers were highly general and when things got specific he showed no interest in jumping in. When he talked about Syria, his answer went in circles. Could it be possible that what hurts Trump is not what he has said, but when he has nothing much to say? Up until now every candidate but Fiorina who has attacked Trump has fallen in the polls. In Wednesday night’s debate it felt like everyone could attack Trump, and it wouldn’t necessarily hurt their standing—perhaps because the discussions were more rooted in policy this time around. Rubio also shined at the tail end of a back and forth between Trump and Bush on Trump’s claim that Bush shouldn’t speak Spanish. Rubio defended speaking the language and told the story of his grandfather—an immigrant from Cuba—who came to love America, and conservatism, and pass both loves on to Rubio. “He taught me that in Spanish. Because that was the language he was most comfortable in,” Rubio said. He said he spoke Spanish to current-day immigrants to reach them: “If they get their news in Spanish, I want them to hear that directly from me, not from a translator at Univision.” It was a moment that Bush was trying to exploit, but Rubio delivered. Christie played to the high road from the very start. In his opening statement he said the cameras should not focus on him but the audience, arguing that the debate wasn’t about him but America. (All appeals to humility feel like they’re aimed at Trump.) Later, as Trump and Fiorina got into a standoff over their business histories, Christie called them out for bickering. Christie wasn’t the only one to make this point. CNN had decided to allow the candidates to mix it up and that led to much bickering. To get airtime, candidates like Christie, Kasich, and Mike Huckabee appealed to the high road, claiming that the bickering did nothing for regular people. Bush and Walker were more in evidence in this debate than they were in the first one—that’s not a high bar—but they are not likely to be in the conversation much as the debate highlights are passed around on Facebook. Bush’s best moment came when he defended his brother after Trump criticized him. “He kept us safe,” Bush said to big applause. Jeb showed some conviction in defense of his brother, which made for good theater, but it probably would have been better if it had been on a policy position or idea rather than that complicated issue of family relations. At one point during the immigration debate it seemed like Bush was on the cusp of using his policy dispute with Trump to show this passion and distinguish himself, but there wasn’t much intensity. At another winning moment, Bush said the Secret Service code name he would pick for himself was “Eveready … It’s very high energy.” Trump, who has been ribbing Bush repeatedly for being “low energy,” liked the answer so much that the two men exchanged a high-five. Trump was then asked to pick his own code name. “Humble,” he said.